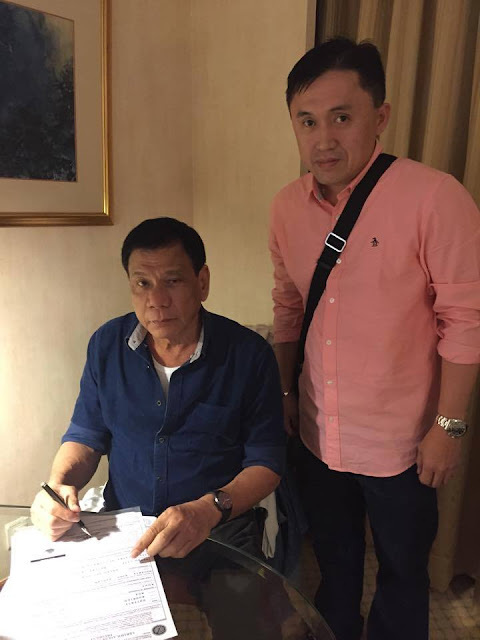 MANILA, Philippines - The Commission on Elections (Comelec) on Friday received first petition against Davao City Mayor Rodrigo Duterte's presidential bid. 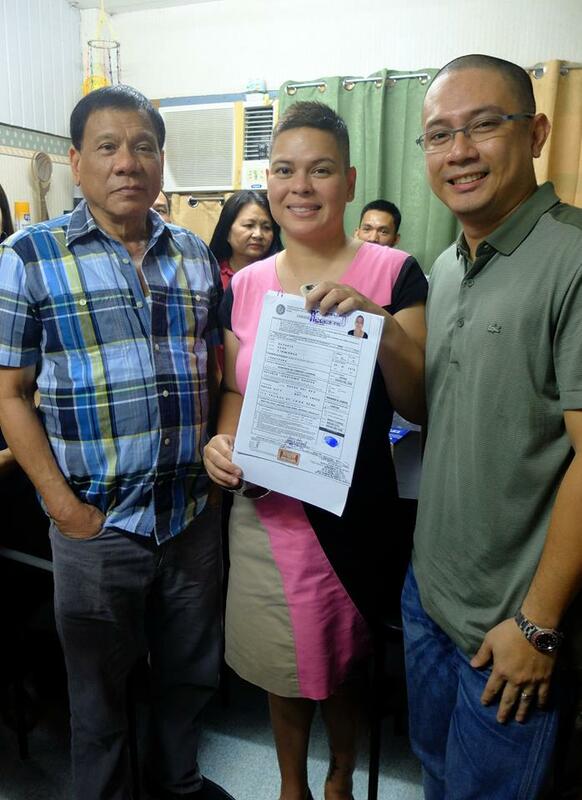 Davao City Mayor Rodrigo Duterte filed his certificate of candidacy (COC) on Friday. 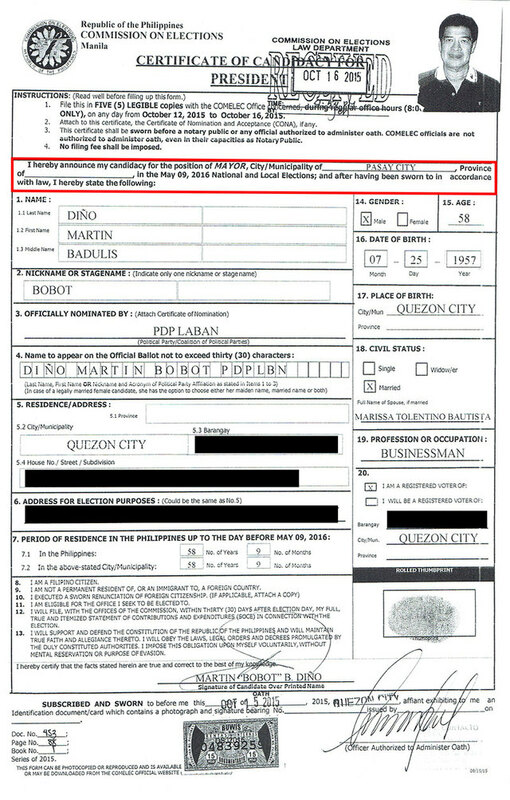 Broadcaster Ruben Castor filed petition to declare Partido Demokratiko Pilipino-Lakas ng Bayan (PDP-Laban) presidential bet Martin Diño's certificate of candidacy (COC) null and void. Diño who withdrew his COC for president was substituted by Duterte as the latter filed COC on Friday noon. Castor pinpointed the error on Diño's COC which was filed few minutes before the closing of filing candidacy last October 16. The signed form states "I hereby announce my candidacy for the position of MAYOR, City/Municipality of Pasay City...in the May 09, 2016 National and Local Elections." Meanwhile, Duterte's camp said they are not worried on the said petition. PDP-Laban president Senator Aquilino Pimentel III clarified “He [Castor] had 5 days from October 16 to challenge Diño's COC. He cannot attack Duterte's COC based on Diño's COC; otherwise the prescriptive period will be put to naught." Shortly after withdrawing his COC for mayor in Davao City, Duterte officially filed COC for president through his representative Atty. Salvador Medialdea. "Today, I withdrew the Certificate of Candidacy I filed last October 15 for the position of City Mayor and asked my lawyers in Manila to file my COC for the position of President. "I also accompanied my daughter, Inday Sara, as she filed her COC as my substitute for Mayor of Davao City. "I have crossed the Rubicon and I hope we are all ready for this very big step in our lives," Duterte shared on Facebook. Duterte led in the Pulse Asia survey conducted on November 11 to 12 in Metro Manila as he got 34% of the 300 respondents who said they will vote for him if the elections were be held at the time the survey was conducted. Top contender Grace Poe was ranked second with 26%, followed by Vice President Jejomar Binay with 22%, former Interior Secretary Mar Roxas with 11%, and Senator Miriam Defensor Santiago with 7%. The final list of the candidates for the 2016 elections will be released by the Comelec on December 15.